Nanomaterials for Magnetic and Optical Hyperthermia Applications focuses on the design, fabrication and characterization of nanomaterials (magnetic, gold and hybrid magnetic-gold nanoparticles) for in vitro and in vivo hyperthermia applications, both as standalone and adjuvant therapy in combination with chemotherapy. The book explores the potential for more effective cancer therapy solutions through the synergistic use of nanostructured materials as magnetic and optical hyperthermia agents and targeted drug delivery vehicles, while also discussing the challenges related to their toxicity, regulatory and translational aspects. 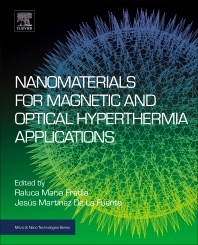 In particular, the book focuses on the design, synthesis, biofunctionalization and characterization of nanomaterials employed for magnetic and optical hyperthermia. This book will be an important reference resource for scientists working in the areas of biomaterials and biomedicine seeking to learn about the potential of nanomaterials to provide hyperthermia solutions. Dr Raluca M. Fratila (Petrosani - Romania) obtained her PhD in Chemistry from the University “Politehnica” Bucharest (Romania) in 2005. She accomplished postdoctoral stays at the University of Basque Country, San Sebastian, Spain (2006–2008), and the University of Twente, Enschede, The Netherlands (2009–2013). In November 2013, she became a Marie Curie COFUND-ARAID researcher at the Institute of Nanoscience of Aragón (INA), University of Zaragoza, Spain. In 2015 she moved to the Aragon Materials Science Institute (University of Zaragoza, Spain) as a Marie Sklodowska-Curie researcher and since 2017 she is a Ramón y Cajal tenure-track researcher at the University of Zaragoza. Her research interests include bioorganic and bioorthogonal chemistry, magnetic resonance imaging (MRI), magnetic hyperthermia and biofunctionalization of magnetic nanoparticles for biomedical applications. Prof Jesus M de la Fuente (Barakaldo - Spain) finished his PhD work in 2003 working in the evaluation of carbohydrate-carbohydrate interactions using gold nanoparticles in the Institute of Chemical Research from CSIC. During his PhD training, he has carried out different stays in the University of Nottingham (UK), University of Kalmar (Sweden), Institute of Physical-Chemistry “Rocasolano”-CSIC (Madrid, Spain) and National Centre of Biotechnology-CSIC (Madrid, Spain). With all this research, he was a pioneer in the emerging field of Glyconanotechnology. Once he obtained his PhD, he moved to the Centre for Cell Engineering University of Glasgow (UK) to develop a research project involving the nanoparticles development and its biological application during two years. In July 2005, he went back to the Institute of Chemical Research (Seville, Spain). His research was oriented to the vectorization of paramagnetic nanoparticles with biologically relevant carbohydrates to label and visualize brain tumors. In June 2007, Prof de la Fuente established the BIONANOSURF Group at the Institute of Nanoscience of Aragon (University of Zaragoza, Spain). Prof. de la Fuente has supervised 15 PhD students (to completion) and he is presently supervising 10 PhD students. Since then, Prof de la Fuente has created a large research group with outstanding scientific results and excellence research projects. As principle investigator, he has received a European Research Council-Starting Grant for “Multifunctional Magnetic Nanoparticles: Towards Smart Drugs Design-NANOPUZZLE” (2010-2015), a European Research Council-Proof of Concept-HOTFLOW (2017-2018) and ERANET project “Multifunctional Gold Nanoparticles for Gene-Therapy-NANOTRUCK” (2009-2012), he is PI of a FP7-NMP “Nanotherapeutics for Antibiotic Resistant Emerging Bacterial Pathogens-NAREB” (2014-2018) and he has supervised 1 IOF and 2 IEF FP7 Marie Curie Fellows and 2 IF HORIZON2020 Marie Sklodowska-Curie Fellows. He has actually 6 licensed PCT patents. To date, he has more than 180 papers, cited more than 6,600 times and with an h-factor of 43. He was awarded with the “Shanghai-1000 People Plan” in 2013 to be Chair Professor at Jiao Tong University (Shanghai, China). He joined the Spanish National Research Council- Aragon Materials Science Institute (Zaragoza, Spain) in 2014, where he is actually Full Professor and Head of the Department “Materials for Biomedicine”.